Here is a documentary called Legacy: Philippine World Heritage Sites narrated by Architect Augusto F. Villalon which gives a good introduction to all these sites. I had to divide it into four parts due to length. Part 1 introduces the UNESCO World Heritage List and talks about Tubbataha Reef. Part 2 discusses the Puerto Princesa Subterranean River National Park and the Rice Terraces of the Philippine Cordilleras. 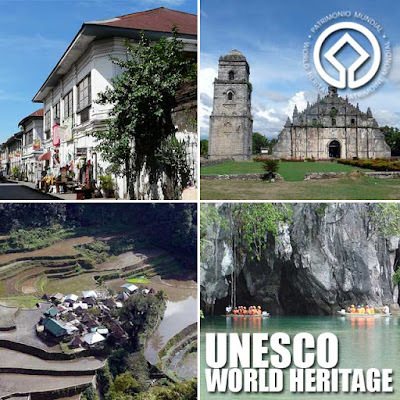 Part 3 discusses the Historic Center of Vigan and the Baroque Churches of the Philippines. Finally, Part 4 talks about conservation challenges that each site is faced with and a conclusion for the whole documentary. I salute Arch Villalon.. i remember how he inspired me to honor and know more about our culture and heritage, during the National Symposium on Filipino Architecture and design 2003. thanks Ivan for sharing this. i subscribe to your youtube channel. Poverty due to corruption is the main reason why this happens in the Philippine society today !!! Pinoy's are always moving forward without knowing what we left behind. Much as blinded by ignorance make us uneducated of our own identity. Thank you Sir for sharing to us your passion. "do it in a pinoy way"